As I prepare for the High Holidays of Rosh Hashanah and Yom Kippur, like most rabbis I feel like time is not on my side. 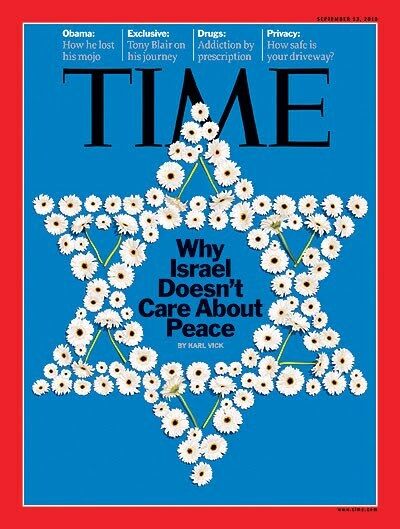 For Israel, however, as the Jewish nation engages in the latest round of a potential peace treaty with the Palestinians, Time is certainly not on her side -- Time Magazine that is. This week's issue of Time Magazine has the bold headline proclaiming "Why Israel Doesn't Care About Peace." I've only read the online version of the article thus far (the online version is an abridged version of the cover story appearing in the September 13, 2010 issue). Overall, it seems that the article itself is fair to some extent, but let's face it -- most Americans are only going to see the cover. They'll see the cover telling them that Israel doesn't care about peace when they're at the grocery store, pharmacy, library, bookstore, and airport. Most people won't pick up the magazine to even read the thesis of the article. Rabbi Daniel Gordis attacked Time Magazine's choice of cover art in his Commentary Magazine editorial. Gordis writes that "The Web version of the story hardly even qualifies as journalism. It's nothing more than a few sentences strung together, interspersed with links to a series of photographs. The printed version, at least, has a thesis, and it's not a bad one. Its claim is that Israelis don't discuss the peace process much (true), that they have low expectations (true), and that they don’t care (also true). And why do Israelis not care?" 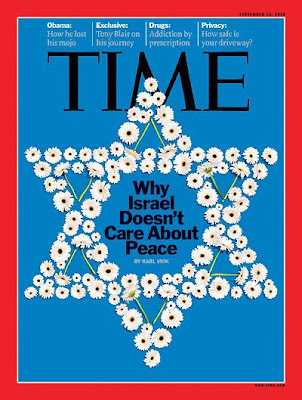 The problem with the article as Gordis explains is that Time Magazine's answer for why Israelis have despaired of peace is because they are more interested in money. Now, if that's not a classic anti-semitic argument, I don't know what is. Unfortunately, those who read the article in Time will simply figure that Israelis don't care about peace because they're more concerned with their hi-tech companies, 401K's, and real estate investments. They won't know that the current peace negotiations were the Israeli prime minister's idea and that the president of the Palestinian Authority had to be dragged to the bargaining table. They won't read the thoughtful responses to the Time Magazine cover story by Danny Gordis or Bret Stevens in the Wall Street Journal. They won't remember Israel's successful peace treaties with Egypt and Jordan. Instead, they'll see photos throughout the cover story of Israelis on a Tel Aviv beach smoking a hookah and silly quotes from real estate agents about how Israelis continue to buy homes despite the missiles falling.